Just 2 Birds: WIWW - Black and Brown? WIWW - Black and Brown? I've never really been one for thinking outside the fashion box. I was always told that black and brown can NEVER go together. But then I got thinking... what about leopard print? That's black and brown to the moon! So out shopping one day I ended up buying a leopard print skirt which is very out of my comfort zone but I'm LOVING it! Now what to pair with it? I went all out with the black and brown. 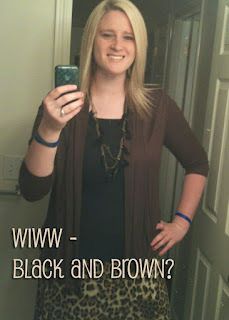 A black undershirt and a brown flowing cardigan. I added my gold and black feathered necklace and gold hoops. I think it looks great! I think fashion should be a bit more about what's comfortable and is pleasing to your eye! But this is coming from someone who is outdated and not fashionable! Julia- You are pretty dang fashionable but I agree completely! Oh Oh Oh, Ok, I really really want to see you wear a RED with this next time, Or a Nice baby blue, or white always works.